Funny Ha-Ha meets Funny Strange every Monday and Thursday. There was an extensive break between watching parts IV and V of this tale. The main reason for the delay was that we were planning a Disney World trip. I could never find any justification for watching the Decline and Fall of Tommy Gunn instead of any of a large number of Classics of Western Animation. Luckily, I knew how good Rocky Balboa was, which aided my pushing to view the first attempt to end the series. Hey Kids, time to take a hike again. Not even bad words this time, just some boring grown up stuff. Click here to read about Disney stuff or go just about anywhere else on the blog for entertaining ridiculousness. The next two entries into the series were VERY Eighties. They contained far more music video montages and far less substance than the original stories. Because of this, they have been hit with much retrospective criticism. This is largely from people who weren’t there. The critics seem to miss the point that the films WORKED. They pervaded popular culture, made a mint and the box office, and had the nation training and singing. Heck, I watched Rocky III working out to get psyched up for my wedding. It is ridiculous to view them only as individual films, when they built on everything that came before. As the two phases these movies represent, they were exemplary. 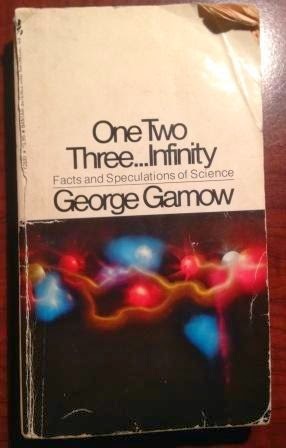 I pulled George Gamow’s 1947 book about EVERYTHING off the shelf of the Book Barn with a pile of other science and sci-fi books. They were all stacked in the same section at the time. It ended up being my introduction to the real world version of the fundamental interconnectedness of all things. It was intensely cool to see detailed examples how that concept, which I’d already seen and embraced through fiction and philosophical angles, applied to science and nature as well. In a bizarrely unusual turn of events, I tried to get my family to watch a high quality, Oscar winning film that did not involve anyone wielding a sword or making unrefusable offers. I will never forget that Rocky won the best picture Oscar in 1976, because of uttering the line, “that kind of movie never wins,” and causing our team to miss an important wedge question in an Up the Lake Trivial Pursuit game. The fact that it was also a love story was far too strange to even bring up. My daughter had a great dislike of boxing in general. My wife had the same opinion, plus was no fan of Stallone. There would be a fight well before Balboa donned his gloves. My daughter has reached the age where she’s both understanding more, and questioning more, about the Considerable Catholic Conundrums she encounters. Luckily I’m around to help out. Lucking out in these two areas led to the first ever original song I wrote that actually has a music video to be posted on this blog. A Carnivore’s Guide to Cardiology: I got the key to the gates of paradise; but I've got too few legs! Apologies to the other Jeff. I’ve put large amount of work and focus into fighting my crappy genetics on the cardiac front these past few years. This is not a post for children. Kids, take a hike. This is also not a post for those adults who are offended by this type of language. Do yourself a favor, and go read some of my cute stuff before moral outrage can kick in. With the final special citations complete, that wraps up the George Awards. Thank you to everyone who’s come along on this long strange trip. Here’s hoping it’s brought some laughs as people remember their favorite films, are reminded of movies they need to watch again, and seek out comedy they’ve never experienced before. P.S. This is where I buy comics. PPS Check out Gary's awesome music! My job is a Principal R&D Engineer for a medical device manufacturer. That's what I do, who I am is more complicated. I learned a long time ago that if you don't see the funny side of everything it can lead to apathy, stress, and denting the side panel of a Ford Bronco with your head (hypothetically). Hey, what's everyone else reading?